With the Snell M2010 Standard hitting the streets in various helmets this year there have been many questions raised. To alleviate any confusion surrounding AMA Racing Rules of Helmet regulations, here are the rules from the 2010 AMA Rulebooks in regards to ECE and SNELL approved helmets. If you read below, you will see that AMA accepts that the helmet must conform to “one” of the following standards. 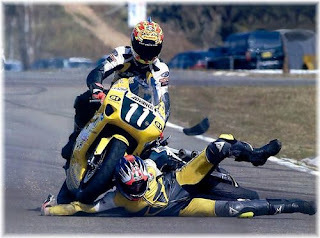 i. Riders must wear helmets at all times when riding on track. ii. Helmets must be of the full face type. standards and have a label affixed certifying its approval. emergency helmet devices is available from AMA Pro Racing. v. Face shields must be shatter resistant. Any of the FIM SFI approved certifications. Hope this helps narrow your motorcycle helmet search!